Have you been using an iPhone for many years, and you have decided to use an Android Smartphone instead? Maybe due to one problem or the other. One problem you could face is having all the contacts on your iPhone transferred to your any Android Smartphone, because definitely some of your contact will not be on SIM only, some will be on phone storage. To start copying or writing down the numbers one after the other will be a very big job for you. 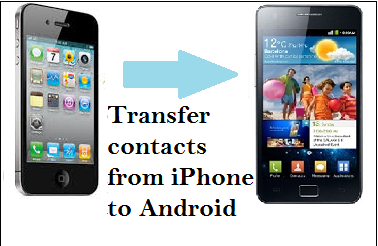 Today, I want to share with you different method to transfer contacts from your iPhone to any Android Smartphone. Note: Things are not the same with iPhone to Android as both the operating systems are completely different from each other. Now, if you want to know how to transfer contacts from iPhone to Android, then read on. Manually: If you want to move some specific contacts only, then you can use Share Contact option where you will need to open contacts and select the ones you wish to copy. Now slide down and choose the tab that allows you to transfer it through text or e-mail. This may not be the best option if you want to save more than ten contacts. Through iCloud: Another way to transfer contacts from iPhone to Android is through iCloud system. Log in to iCloud.com through your computer and select the contacts you want to export. You can select them either one by one or all of them. Now click the gear and select Export vCard. The computer will begin downloading VCF file that contains the contacts. Now plug your Android device to your computer and copy that VCF file to the local storage and save all the contacts in your phone. Contacts and people application contain features that lets you add contacts from many sources. Just open the app and import it from your storage source. Through an App: You can also take the assistance of an application called My Contact Backup app where you don’t need to consult with your PC. Just download the app on your iPhone and launch it. After the app launches, it will ask you to access the contacts. Just tap OK and then tap backup. Now go to email and attach the VCF file and send it to your Gmail. Now open the file through your Android device and import the contacts in a similar manner as above. Through Gmail: In case you use Google frequently, you can use Gmail as well to import the contacts from iPhone to Android. Just follow the method 2 and save the contacts through iCloud in your computer. Now login to your Gmail account through Android device and click on the Gmail icon on the left corner. Click contacts and then select Import. In the end, all the contacts will automatically be synced to your Android phone. Export through iTunes: If your iPhone version is lower than iOS 4, then other methods won’t be applicable, since apps are not compatible with lower version and iCloud didn’t existed. iTunes may be frustrated sometimes, but it does the job done and could be the only way for iPhone 4 user to transfer the contacts. In order to do that, download and install iTunes and connect your iPhone to your computer. Now open the handset device summary page and click info. Check ‘sync contacts with’ and click Google Contacts. Click apply and make sure your Android device is connected to your Gmail account. Allow Google to sync the contacts to your Android device. Above are few ways by which you can transfer contacts from iPhone to Android phone. Note: If there are others ways you know or have been using, please feel free to share it with us using the comment box below. Did you found any of methods or processes above confusing, no need to worry, that’s why we have the comment box below for you. Also, please feel free to ask any questions, if any.